A big balance is required for anyone willing to take on a bank job in Rotherham town centre. Rothbiz reported last year that the Royal Bank of Scotland Group (RBS) branch was one of 162 branch closures announced by the taxpayer-backed group after it decided that NatWest should become its primary customer facing brand in England and Wales, and Royal Bank of Scotland its core brand in Scotland. The group, which has also recently closed its Swallownest and Wickersley branches, vacated the town centre in November. Now, agents at Avison Young (the real estate company formerly known as GVA) have been drafted in to sell the prominent 11,324 sq ft property. The property at the foot of the High Street extends over basement (complete with strongroom), ground, first and second floors and comes with ten parking spaces at the rear. With the freehold up for sale, offers are being invited in the region of £425,000. The agents believe that the premises are suitable for A3 planning uses (Cafes and Restaurants) and A4 (Drinking Establishments), subject to securing planning permission. 1 - 9 High Street has its history in the Sheffield & Rotherham Joint Stock Banking Co Ltd which was a past constituent of RBS. 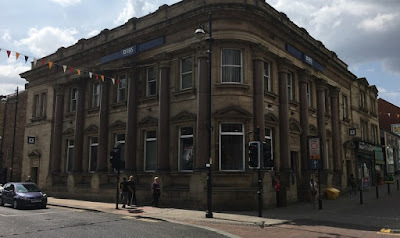 The bank was established in 1792 by famous Rotherham steelmakers, the Walker brothers; along with Vincent Eyre, agent of the Duke of Norfolk (the principal landowner in the area); and William Stanley, a local businessman described as a "gentleman well-known and much respected at Rotherham." The bank renamed Walkers & Stanley in 1829 and in 1836 the business was sold for £27,000 to a new joint-stock company, Sheffield & Rotherham Joint Stock Banking Co. The bank grew rapidly but the business was not without problems. Major accounting deficiencies were discovered during the 1840s and bad debts soared during the local commercial depression of the late 1870s. In 1907, with a paid-up capital of £256,000, the bank was acquired by Williams Deacon's Bank Ltd of London and Manchester. This was later acquired by RBS. The Grade II listed building was built in 1892 possibly on the site of the "OLD BANK / FOUNDED 1792" as the sign above the doorway reads. The impressive building is notable for its polished granite columns.